We’re excited for National Mod Podge Day on Friday, May 18, 2018! To celebrate all things Mod Podge, we’re giving you a chance to win Mod Podge prize packs all month long! Post a photo on your public Instagram feed of something that you’ve made with Mod Podge and use the hashtag #NationalModPodgeDay to enter for a chance to win throughout the month of May 2018! Someone each week will win a Mod Podge prize pack - winners will be drawn at random. Open to US residents ages 18+. Winners will be contacted via Instagram message. Entry period ends June 3, 2018. If you’re not familiar with Mod Podge, it’s time to meet America’s Favorite Decoupage Medium™. Over the past 50 years, Mod Podge has expanded from the original Matte and Gloss formulas and is now available in 21 unique finishes in a wide range of sizes, from 2 oz. to classroom size gallons. Don’t miss our live stream tutorials on our Facebook page all month long with tips and tricks on how to use Mod Podge - follow us on Facebook now! 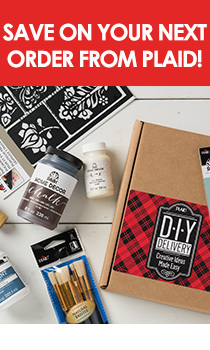 Also, watch for a very special Mod Podge promotion on Plaid Online on Friday, May 18th! Made to be a Momma created some DIY Fabric Embellished Succulent Planters with Mod Podge Fabric. Cherished Bliss created these DIY Faux Concrete Vases. She crafted them using Mod Podge Dishwasher Safe formula. Petticoat Junktion shows you how to How To Use Mod Podge On Fabric And Furniture. She used Mod Podge Hard Coat and Fabric. Positively Splendid created Lace Doily Bowls using Mod Podge Stiffy.